The glasses shipped relatively fast and communication was awesome. I was saved a considerable amount on my order even though the amount due was my mistake. The glasses themselves come in a nice nylon bag and also with a wiping cloth. They cover the whole eye and filter desired frequencys very well. For the money you can not get a better pair of laser goggles. These safety glasses are an absolute must when using the new Blue Lasers. They are so good I first thought my device was not working until I took them off and saw the very bright blue laser beam. Ask yourself one question,is the price of the glasses worth your eyesight? Because once it's gone it's gone forever! The safety glasses I received from Dragonlasers work perfectly. They are very effective at blocking the light from the high-power green lasers I use. The glasses are made of quality materials, and I would recommend them to anybody who needs a serious instrument for laser works. The Laser safety glasses for blue and green Lasers are excellent! This glasses allows much more experminets with Lasers and you can get more fun. The Quality and the prices for this glasses are great! Safe your eyes against dangerous Laser beams and scattered light for a little money! Die Laserschutzbrille für Blaue und Grüne Laser ist Weltklasse! Mit ihr macht das experimentieren mit Lasers erst richtig Spass, denn man wird absolut nicht mehr geblendet und fühlt sich demnach auch sicherer beim Umgang mit Laser. Man sieht nur noch den Brennpunkt des Lasers, so dass man nicht mehr vom Streulicht geblendet wird. The safety glasses are brilliant, they allow me to look at the dot of my 50 mw green laser making it appear as ~1 mw dot. I can burn things with my laser while looking at the dot. There is only one dangerous component of these glasses that many customers need to know: While shining the laser at light pink objects with the safety glass on, the dot appears normal with no decrease in intensity. Great Vendor and GREAT PRODUCTS, exactly how described ! and quickly shippment to BRAZIL !! The laser safety glasses for green laser: very effective blocking of this laser radiation, plus well made and comfortable to wear. Glass diffraction gratings: these are great fun to use. I'd just reccommend to protect them so they are held in some sort of casing to avoid being scratched. Good service from Dragon lasers and no problems sending things to UK. I choosed LSG-08, because it cover blue and red spectrum and offer better attenuation factor for booth red and also for blue. In the past I used 2 pair googles (LSG-02 and LSG-03) to cover entire red and blue spectrum. Now I am using only one pair for better protection (attenuation factor for red and blue is over 10.000 instead 3200 as it have LSG-02 and LSG-03 models). LSG-08 cut off entire laser beam. (100.000) than on ultraviolet/blue (10.000). I have no doubt that this google are up to spec. I recieved my diffraction grating and safety glasses much more quickly than expected. The diffraction grating was amazing and worked perfectly, I didn't lose much beam quality and it amazed me and my friends. The safety glasses were also incredibly useful, not only can it be an important safety tool,which it is excellent for when I can accidently reflect a beam, but is great for focusing in a spot to burn. It takes away a lot of extra glare while still having fine visibility. 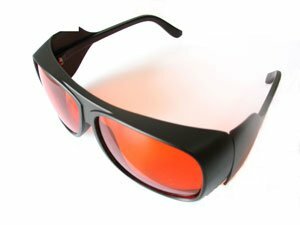 I bought a pair of laser safety glasses to use with a red laser, based on the diode of a DVD burner. They are really effective at blocking that wavelength: in fact, the first time I used them I could not even see any spot where I was aiming the laser! Later I realized that I was not supposed to look for a big bright spot, but for a small, very dim red point (or, when the laser is focussed, for a tiny, bright white/green point), which is all that remains of the diffused light when most of it is blocked by the glasses. I always wear those safety glasses when I use that laser, and so far I am really satisfied.